We all know a dish like this isn’t the healthiest thing or the cheapest thing in the world, but can I say balance? And if you’re going overboard, well go over right – these are more than worth it! Crunchy, spicy shrimp and that sauce! Oh, my, that sauce. Not only is coleslaw a classic pairing with this dish, it’s inexpensive, too. That helps balance the cost just a bit. I made the whole meal for under six bucks – and we were seriously stuffed. In a large bowl, soak the shrimp in a mixture of buttermilk and hot sauce for 20 to 30 minutes. In a shallow dish, whisk, together the cornmeal, onion powder, garlic powder, paprika and cayenne. Drain the shrimp and toss them in the seasoned cornmeal. Working in batches, fry shrimp until golden and crispy, about two to three minutes. Remove with a slotted spoon and drain on paper bags. Season with salt, to taste. Split the rolls and smear with Creole mayonnaise. Line with plenty of shredded lettuce and top with fried shrimp. Serve with hot sauce. Yield, about a 3/4 cup, so it makes a little extra. This entry was posted in Click here for Bargain Meals, Click here for Fabulous Food Posts and tagged Buttermilk, Cajun & Creole, cornmeal, Fish and Seafood, Po' boy, Sandwiches, Shrimp, Southern Cooking, Tyler Florence. Bookmark the permalink. 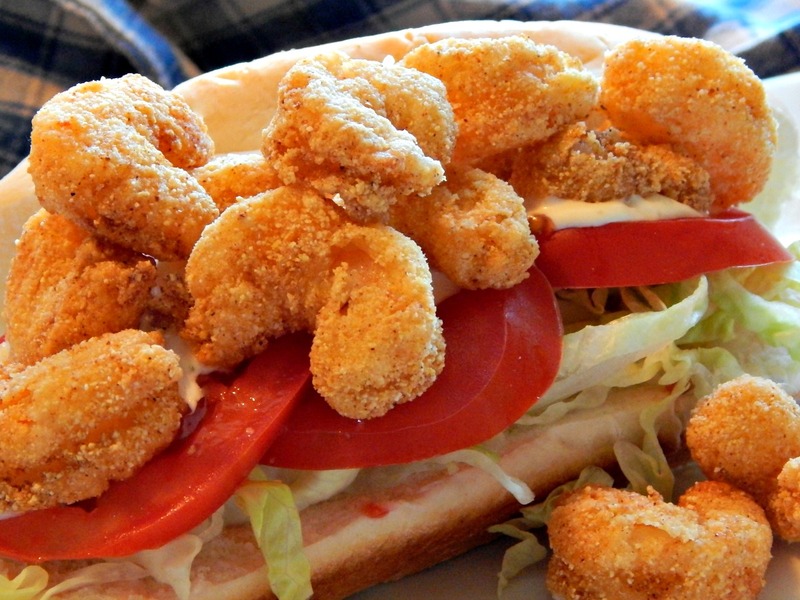 These po’ boys look delicious. I was looking for a shrimp recipe to feature in my “Guitar Mancer” post a couple of weeks from now. I’d like to link back to this one, if you don’t mind. I would love those to eat those shrimp.